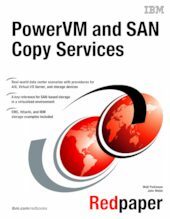 This IBM® Redpapers™ publication is a guide to Copy Services as managed by AIX® in a IBM PowerVM™ virtualized environment. The goal of this paper is to provide step-by-step procedures about how storage subsystem-based Copy Services are accomplished in a virtualized environment and the approach for which they should be adopted. While there are numerous storage subsystem vendors in the marketplace and industry, this paper has been limited to the vendors and the technologies described above.